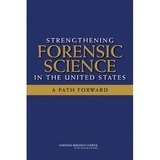 The T-Model Fingerprint Calculator v. 9.9 addresses criticism of fingerprint analysis presented in the National Academy of Science (NAS) report "Strengthening Forensic Science in the United States: A Path Forward". "If a latent print examiner wants to perform fingerprint analysis work that speaks to the criticism of fingerprint analysis cited in the NAS Report, then simply carry out well-controlled, reproducible, honest experiments of the T-Model yourself. If the calculator does what it claims it can do, then you have foundation to use it in criminal casework." Makes formulae and values transparent for testing and critical review. Results are fast, objective and transparent. Click the below Calculator link to access the calculator via Dropbox and the interactive calculator should appear on screen. Next click the below Legend and Procedure links, open a window for each of these (or print each out) and use them as guides for how to operate the calculator. To print out a copy of the Fingerprint Calculator Report for each case, use landscape format. The T-Model Fingerprint Calculator was designed by retired San Jose Police Department Senior Latent Print Examiner Henry Templeman (see below) (CLPE). The calculator was first published online in 2008 and the latest interactive version of the calculator (v.9.9) was published online August 2013. 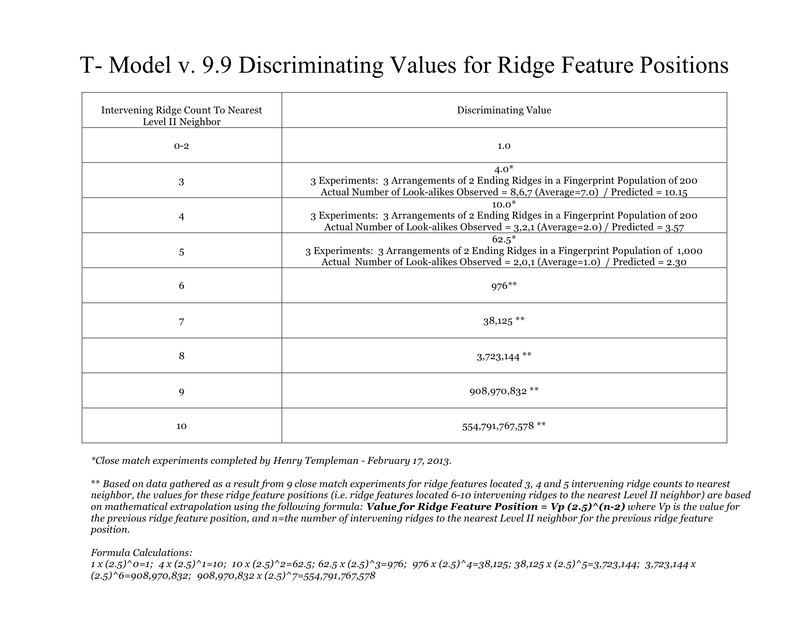 The primary function of the calculator is to calculate the rarity of individual and clusters of fingerprint ridge features, and based on the relevant population for the case at hand, including a range of fingerprint population groups ranging from 100 to 1 trillion, estimate the conservative (upper bound) number of fingerprint close matches or "look-alikes" likely to exist. When the calculator estimates the number of fingerprint look-alikes is less than 1, then it infers a "match". The T-Model Fingerprint Calculator is readily testable for purposes of critical scrutiny, corroboration or refutation. It has been submitted to members of the International Association for Identification (IAI), the Scientific Working Group on Friction Ridge Analysis, Study and Technology (SWGFAST) and the Federal Bureau of Investigation Latent Print Unit (FBI). So far, it has not been refuted, falsified, shown to be inferior to any other mathematical fingerprint model or shown to be inferior to human decision-making with regards to making correct decisions, especially when pitted against the largest and best fingerprint look-alikes ever recorded or when predicting numbers of look-alike fingerprints likely to be present in a given population group. Based on data gathered as a result of 47 fingerprint look-alike experiments, the calculator has shown to make more accurate decisions than latent print examiners which makes it extremely appealing for use in criminal casework (i.e. see Validation Study for 38 experiments under snapshot version 9.2 published by the Internet Archive Wayback Machine on August 18, 2012 here; see data from 9 additional experiments here. NEW) Data from experiments is the empirical content that gives the T-Model predictive power which has shown to be more accurate that conventional human decision-making by latent print examiners. "For Karl Popper any theory X is better than a "rival" theory Y if X has greater empirical content, and hence greater predictive power, than Y"
Support latent print examiner findings. Challenge latent print examiner findings. Replace the latent fingerprint examiner to evaluate the suitability of latent fingerprints for comparison. Replace the latent print examiner to evaluate sufficiency (or insufficiency) of matching ridge features in two fingerprints to infer identification. Latent print examiners interested to apply the T-Model Fingerprint Calculator to criminal casework should first test it to find out if it does what it claims it can do. The data from the above 47 experiments should be carefully reviewed to see how testing should be performed. If test results show that the calculator does what it claims it can do, then you have foundation to use it in casework. It is important that test results are carefully documented for purposes of court testimony, if needed. 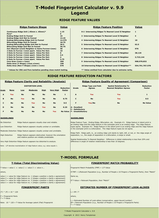 Click the below PDF files for additional information and sample case. For questions, comments, suggestions how to improve the calculator, or for additional information about it, please email Henry Templeman, the designer, at henrytempleman@gmail.com. T-Model designer Henry Templeman retired from the city of San Jose as a Senior Latent Fingerprint Examiner in March 2013.